Next keyboard evolution – Kinesis Advantage 2? | Who Says Penguins Can't Fly? Another year has passed since my last blog post, so I guess it’s about time for me to write another post. Talking about writing, I’ve been eyeing new keyboards recently, more specifically the Kinesis Advantage 2. That’s what this post is going to be about. I started thinking about keyboards again after my friend bought a new mechanical keyboard. I’ve been extremely happy with my TypeMatrix 2030, which I’ve been using together with my custom Dvorak layout (Chvorak) for about eight years. I love the matrix layout of the TypeMatrix (i.e., the keys are laid out in straight columns instead of being staggered), and I find that the placement of the Shift keys, Enter, Backspace, etc. are much better thought out than on normal keyboards. The “double-scissor” keys on the TypeMatrix feel OK to me, but I’ve wanted to try a mechanical keyboard for a while. I’ve been interested in the Kinesis Advantage for a while (I mentioned it in my Dvorak post), but the steep price, combined with the fact that I couldn’t try it out without risking to pay a hefty shipping fee if I didn’t like it – living in Sweden and being a poor student at that time didn’t help – meant that I never gave it a chance. Now that I live in the US the shipping is no longer as big an issue, and although my status as a poor student still remains, it feels like now is a good timing to give it a try. So I started to read more about the Kinesis Advantage. I’ve knew a bit from my previous research, for example that it’s one of the highest rated keyboards for comfort, that you can remap keys in the hardware, and that there are more keys for your thumbs to press to relieve some of the heavy burden of the pinky fingers. Upon further research I found that common complaints about the Advantage include: stuck modifier keys due to bugs in the firmware, not-so-nice rubber keys in the top row, and problems with the remapping (again, due to firmware bugs). That sounded a bit concerning for such an expensive keyboard. But at the same time, I found out that the Kinesis Advantage 2 was about to be released, which claims to fix all of the above issues. What a perfect timing! As I said, the Kinesis Advantage 2 fixes some of the most common complaints about the previous generation. For example, the function keys in the top row now have mechanical switches. I think I would prefer the top rows keys to have normal keycaps as well (although I can’t say for sure since I haven’t tried the keyboard yet), but hey, at least it seems much better than the old rubber keys. Personally I don’t use those keys that much except for Escape, and being a vimmer, that key is definitely going to remapped as soon as I get the keyboard, probably to one of the thumb keys. The Kinesis Advantage 2 has also improved the remapping aspect greatly by introducing a new remapping and macro engine (SmartSet). I wouldn’t be surprised if the new firmware has some bugs, but at least you can upgrade it in Advantage 2, making the keyboard much more future-proof. Finally, I appreciate that the Kinesis people went the extra mile to make it possible edit the keyboard layouts in an OS-agnostic way – basically the layouts are plain text files that can be accessed similarly to how you access files on a thumb drive. Very cool. After finding out about these improvements and seeing how well the company Kinesis seems to treat its customers and the larger community, I feel like I’m willing to take the plunge and give the Kinesis Advantage 2 a try. Spending the money on the TypeMatrix 2030 (actually two, since I have one at work as well) is something I haven’t regretted a single day. If you’re not a keyboard enthusiast and think that spending $349 on a weird keyboard is crazy, then I can only tell you this: each to their own. I use a keyboard for more than 10 hours a day, so paying a bit extra for more comfort is worth it to me. Furthermore, these ergonomic “weird keyboards” will hopefully be better for my fingers and arms (after all, that’s what they’re designed for), which could protect me from developing RSI and similar health issues in the future, potentially saving me from a lot of discomfort and health-related costs in the long term. Finally, I simply enjoy trying out new keyboards and thinking how to maximize comfort and efficiency. True, relearning how to type can be a frustrating experience, but it’s also incredibly awarding. Given the above points, I was always perplexed by how little most people seem to care about what their keyboards and keyboard layouts look like. One of the best things I did with my custom Chvorak layout was to put common symbols (e.g. parentheses, brackets, #:=+~ etc.) 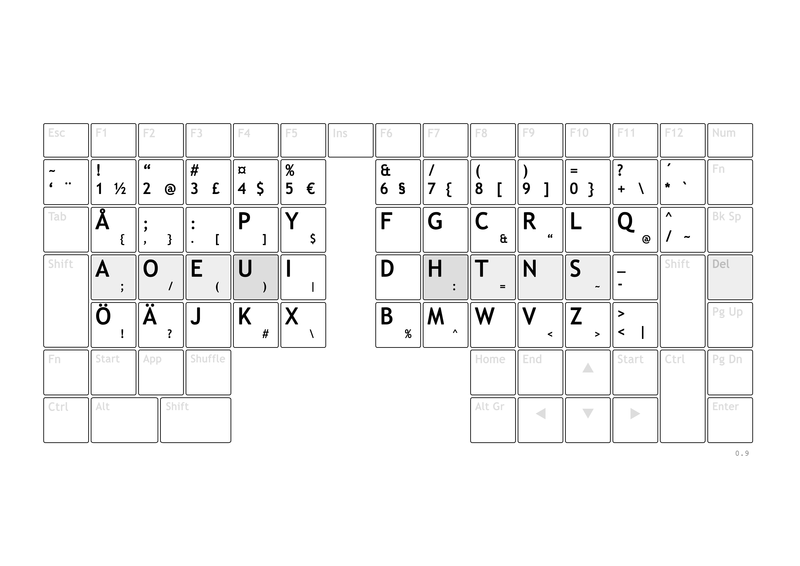 on the normal keys, easily accessible by holding down AltGr (inspired by the Svorak A5 layout). This is something I think every programmer should do. And it seems like more and more people are doing something similar (referred to as “layers” by the community I believe). Researching the Kinesis Advantage 2 I’ve also found that the keyboard community has grown a lot, and there are many more unconventional keyboards out there now (e.g. ErgoDox, Keyboardio, and Dactyl) than the last time I checked, including incredible home-made creations. Although making your own keyboard sounds like tons of fun I don’t think I have the time or money at the moment. But I do plan to give the Kinesis Advantage 2 a chance – stay tuned if you’re interested in my thoughts on the keyboard (it won’t take me another year to write the post, promise). The trouble with the ergonomic keyboard is that you get so used to it, typing on an ordinary keyboard would at times becomes a challenge. I got so used to the shallow keys of my Apple A1243, that I found it extremely hard to use my brother’s mechanical gaming keyboard. And this despite being in the same layout and the same format. So imagine using something that is so considerably different.